A new complication is born: the intimate complication. Imagine a window of time, arranged each day at a different time, a sort of time-out that you can reserve just for you, an exclusive time. Only you would know how to employ this time that is reserved for yourself. It is a strategic time, a way to step back, an indispensable time of reflection before taking an action. It is a necessary retreat to then better move forward to reach a goal. Watchmaking and astronomy, as we know, have been related since the dawn of time. them again into two 12-hour periods, with a special period lasting from sunrise to sunset—conventionally fixed between 6 o’clock in the morning and 6 o’clock at night. This 12-hour daytime period was then further divided into segments of 90 minutes. Among the day’s 90-minute periods, one is special, and they called it Rahu Kaal (the time of Rahu). This period is intended for thought and reflection rather than action. It is an intimate time, a private time. It is not a social time. It is a time that should be reserved for oneself, every day. We might call it the Strategic Period. These temporal periods, judiciously arranged, correspond perfectly to the strategic periods of reflection, which are necessary in the daily whirlwind of time. They represent an essential step back, one too often ignored, by stressed executives during the day. These personal times are used for examining options or making choices and decisions, to avoid having to undo and redo what was badly designed or done in a hurry. In terms of management, for example, doesn’t reaching our goal require a time of reflection to observe the world around us, to understand its structures, to predict changes and to plan our courses of action? Isn’t time itself our primary resource that we must both tame and respect in order to use it in the best possible way? Now, for the first time ever, the Swiss watch brand BorgeauD has created a mechanical complication to remind us of these special daily moments. It is called the SEPTAGRAPH (TM). 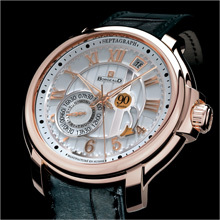 A unique solution was found by BorgeauD, which designed and constructed a new, totally original, and patented watch complication, that it named the SEPTAGRAPH (TM) (from the Latin ‘septua’ meaning ‘seven’ and the ancient Greek ‘graphein’ for ‘to write’). Over a weekly cycle, where each day has a different reserved time, the SEPTAGRAPH (TM) activates a countdown mechanism that runs for 90 minutes. The time of the specific time period—of this Strategic Period as BorgeauD calls it—varies from day to day, and is indicated in a counter placed between 6 o’clock and 9 o’clock. At midnight, the jumping hand of the counter automatically moves to the day that has just started. Every day, at the appointed time for the activation of the Strategic Period, a large arrow positioned between 3 o’clock and 5 o’clock instantaneously fills with colour, thus signalling the beginning of the period and its countdown. At the same time, a circle at the top of the arrow (engraved with an ‘SP’ for Strategic Period), also fills with colour. As the 90 minutes count down, the colour gradually leaves the arrow until it is again white after the period ends. Up to now, there is no other complication comparable to the SEPTAGRAPH (TM) in time-keeping. It is not only a new indicator whose activation varies from day to day, but it is also original in that it does not signal a remaining energy level or time that has passed, but rather it shows the accumulated intimate time that we will give ourselves. This is not a time that closes behind us but rather a time that opens before us. The automatic calibre, the BRG 13501, equips the 1358 model and has been developed, constructed and produced in-house by BorgeauD. Its architecture is different and more compact since the specific complication of the SEPTAGRAPH (TM) display is totally integrated into the movement rather than designed as an additional module. This integration allows additional complications to be added without increasing the thickness of the calibre. This is the first step of a development that, in the years to come, will include other additional complications. The movement features a 53-hour power reserve and a date at 1 o’clock. In the tradition of Haute Horlogerie, all its component parts are hand-engraved, polished, circular-grained or decorated with the Côtes de Genève pattern. The screws are blued, the bridges chamfered, and, as an additional design feature, their collars are slightly inclined. The superlative finishing of this movement attests to its very high degree of excellence. Swiss Manufactured 7 components multilevel Opalin dial, with gravage, azurage and Opalin treatment. 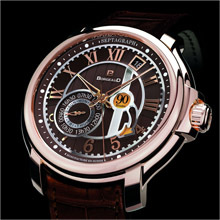 46mm diameter Swiss manufactured rose gold 18ct with and elegant and unique construction featuring case-band extension to the lugs. Stylized crown with BORGEAUD monogram. Convex sapphire with anti-reflective treatment and transparent back over. Numbers engraved on the back cover. Swiss manufactured movement with automatic winding BRG13501 caliber with a unique and exclusive complication, SeptagraphTM, 37 jewels, 28'800vph, 52-hours power reserve. Diameter 30,6mm and thickness of 7.163mm. Finishing with perlage, côte de Genève, chamfered edges, polished treatment and elegant engraved inclined flange. Exclusive personalized hand finished rotor. SeptagraphTM, unique seven days complication with non sequential daily 90 minutes Strategic Period (SP) counter mechanism, with double coaxial and a retrograde disc.